Oh, Tech 4 Kids, how we so desperately wanted your Kickstarter-funded, awesomely branded new line of toy blasters to shake things up in 2013. In fact, we wanted so badly for Nerf to be upset from its de-facto status as “king of the blasters” that we included you in this list if for no other reason than to encourage you to give it another go in 2014. Unfortunately, what we actually ended up with in both the Tek Recon Havok and Hammerhead products this year was a pair of blasters that looked great, but clearly have a long way to go. Neither product quite lived up to the look and feel that the Kickstarter images promised, and more importantly, neither lived up to the fun that the campaign implied the blasters, the new “NRG” rounds, and the iPhone/Android app would actually deliver. 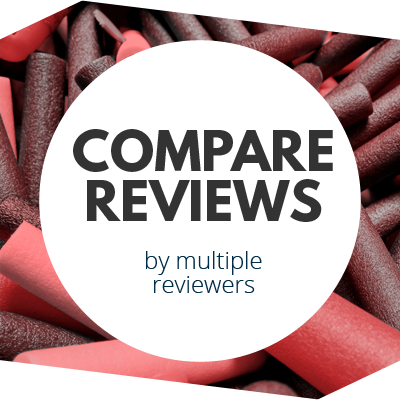 Instead, the blasters had a somewhat 2nd-rate build quality, the app was basically pointless (the “radar” being a notable exception), and the NRG rounds were neither fun to use nor superior in any way to the dart and disc-based ammo used by the competition. In fact, this was one of the first times we can remember actually returning an item to the store because it performed so badly relative to our expectations (so long, Havok). But we don’t want to end on a sour note. Rather, we wholeheartedly applaud Tech 4 Kids on attempting to do something new in the category, for creating a brand that looked the part, and for creating the retail relationships that should allow it to continue releasing new products into 2014 and beyond. 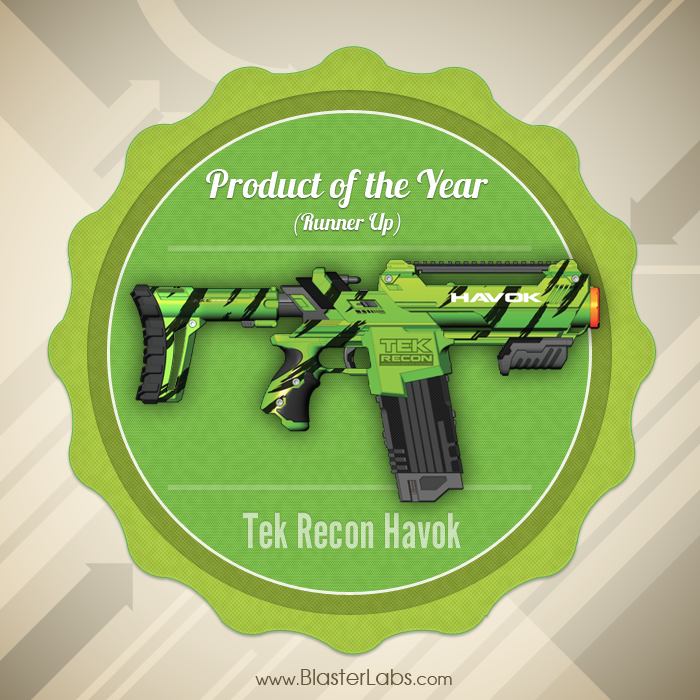 We’re giving the Tech 4 Kids Tek Recon Havok its “finalist” recognition not for what the blaster actually delivered, but for what we believe it will allow Tech 4 Kids to accomplish in the future. 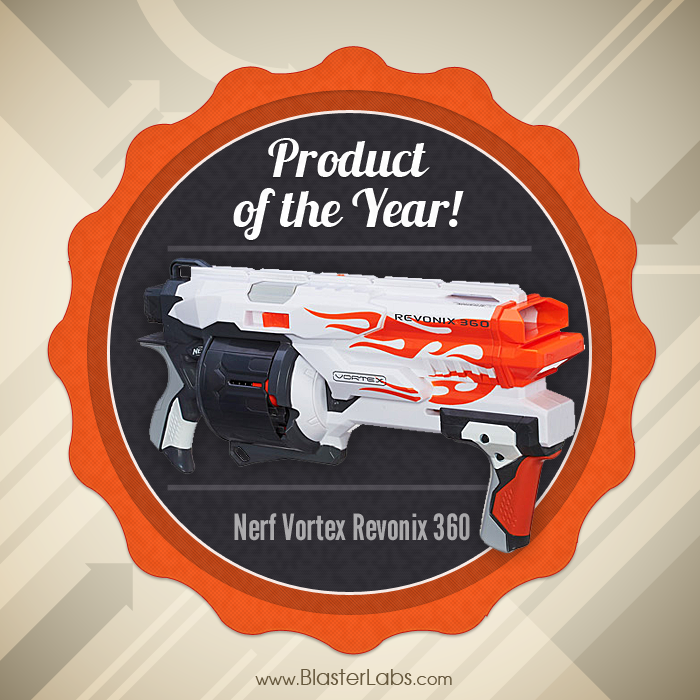 We admit to being lukewarm on Nerf’s flywheel-based blasters in year’s past. The Barricade RV-10 was a favorite among a few of our staff, but it never shot quite as far as other blasters, and the constant whirring of the flywheel eliminated any attempt at stealth. And with a limited capacity of 10 darts, reloads were fairly frequent. But the Elite Stryfe changed all that. The Nerf N-Strike Elite Stryfe essentially took everything we liked about the Barricade and made it better, all while eliminating most of its shortcomings and coming to retail at a price that was a real bargain. Having purchased our stock Stryfe for only $12.99 (and eventually a Mission Kit-equipped version for less than $29.99 on sale at Kohl’s), we initially didn’t expect much from this blaster. We were wrong. 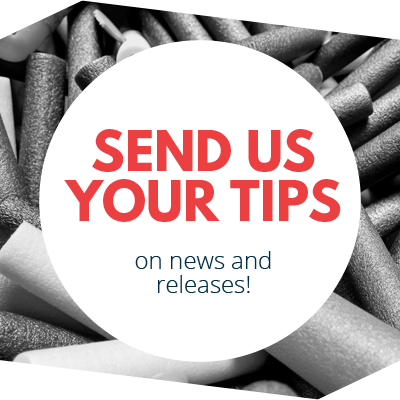 The Stryfe ripped out shots that were consistently in the 30-40 foot range, with shots in the upper-50s achievable when the flywheel was allowed to reach top speed. In addition, the “Acceleration Trigger” meant the clunky on/off switch of the Barricade was no more, and the rate-of-recovery of the amped-up flywheel meant rates-of-fire easily equaled or bettered its forebear. The only real downside of the Stryfe for us was the puny, 6-disc capacity of the stock clip. For a blaster than can easily hit 2 shots-per-second, this clip is seriously under-spec’d. And though easily remedied with any number of other clip options, this oversight (intentional or otherwise) was enough to move our feelings from “surprise of the year” to more of a “well, that’s unfortunate” kind of attitude. And that’s not enough to win our top honor, despite this blaster being a terrific value, and a fun surprise overall. We know what you’re thinking: “The Revonix? Seriously? What about the Pyragon? I like my Pyragon way better!” Ok, yes, the Pyragon is a great blaster. It’s got a huge, 40-disc capacity, awesome Slam-fire ability, good range… what’s not to like? Here’s the thing: The Revonix 360 basically does all that and, according to our tests, does it better. For starters, our Revonix simply out-performed our Pyragon. Call it a ringer, but our particular Revonix hit mid-60 foot ranges flat from chest height, over and over again. And with a modest incline, we could easily reach into the 70-foot range—and we’re doing this in a hallway that is only about 8 feet across, meaning they have to stay on-course to reach maximum ranges. But apart from outright performance, we also like how easily the Revonix can be reloaded. The Pyragon requires a massive drum or at least a few disc clips at-the-ready at all times. The Revonix keeps it all on the blaster—just reload as you go—no stopping to switch clips or refill a drum. Oh, and like the Pyragon, the Revonix can slam out shots over and over again, with no jams in sight, despite its relative complexity and somewhat rough-feeling (and sounding) priming action. Call it over-engineered, call it loud, call it inelegant. We wouldn’t disagree with any of those criticisms. Nevertheless, when the Revonix comes out to play, people scatter. It’s a big, tough, downright formidable blaster with awesome capabilities and some unique engineering that solves real problems (like refilling a large capacity on-the-fly). It’s a little rough around the edges, and not a huge leap in performance versus other Vortex blasters. 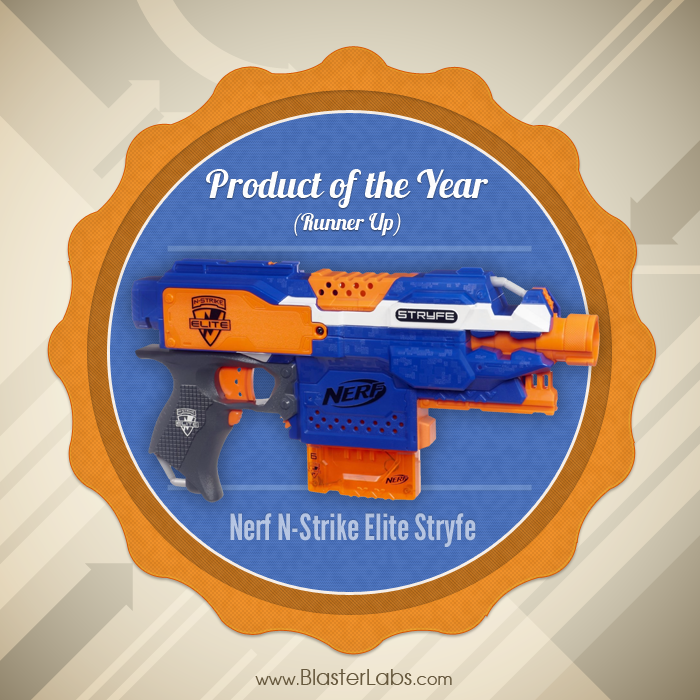 But it’s still unique enough—and fun enough—to have earned our nod for the Blaster Labs 2013 Product of the Year. I agree Tek Recon had so much potential, but they missed the mark somewhere down the line. 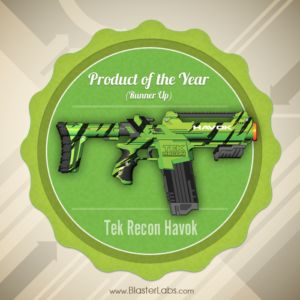 The Stryfe is such a fun go to blaster – I would have thought the EAT making the list – runner up if not winner? It’s still my go to blaster! I mess around with that blaster more than any other right now. Even if I have blasters at hand I will go LOOKING for my EAT. Says a lot in my book. Neither did we, Ash! Honestly, since I personally own a Pyragon, I put off buying the Revonix for months. But one of our other guys did buy it, and it floored us from the very first use. Regarding the Elite Alpha Trooper, we honestly haven’t tested the Elite version yet. I liked my regular N-Strike Alpha, but broke it during a failed OMW upgrade, and have yet to move up to the Elite. 🙂 Have you tried the Elite Rampage? It think it’s pretty similar to the EAT in function, and we have one in here now that is hitting over 70 feet! The Revonix is a horrible blaster. It’s loud (and I like loud usually), clunky, overly heavy, and hard to reload. I thought reloading on the fly would be great, too bad you load in stacks that take a while to spin around. So, if you load up one before being attacked, you have to go through more than a few blank shots before you get another round out. I much prefer the Pyragon to the Revonix. I’m surprised you chose it. It is loud, very loud, a little clunky, and heavier than most, but not too heavy to handle. Reloading we found to be pretty simple really, and easy because there isn’t a need to pull off the clip first. While you are right that it may take a few blank shots before getting a shot of if you only load in one shot, we’ve found that’s still faster than having to reload the Pyragon. But to each their own! Glad to hear your thoughts on it though!